Aimed at generating awareness on the various attractions and destinations of SOCCSKSARGEN, the "12th Paradise Familiarization Tour" organized by the Department of Tourism Region 12 (DOT-12) held from October 30-31, 2013 was success. More than 30 individuals mostly from DOT-accredited tourist oriented establishments (TOEs) joined the fam tour to some of the region's destinations. The participants were composed of hoteliers, tour operators, restaurant owners, members of the local media and bloggers. 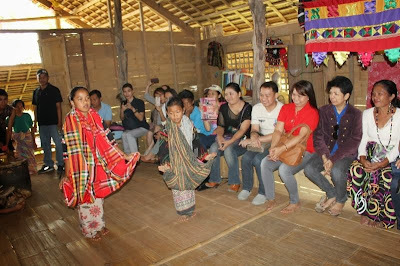 Some of the destinations visited by the Fam Tour participants were the Kablon Farms Display Center in Tupi; the culture-rich Lake Sebu where they danced with the T'boli's, played indigenous T'boli musical instruments, wore native costumes and meet the National Living Treasure, Lang Dulay. They were also brought to the T’boli School of Indigenous Knowledge and Traditions (SIKAT) and in Polomolok, the vast Dole pineapple plantation at the foot of the picturesque Mt. Matutum. In Sultan Kudarat, they toured the Sultan Kudarat Provincial Capitol and were immersed in Tacurong City’s Bird Sanctuary. They have also visited the 32-hectare Gensan Fishport and the Manilay Ancestral House in Brgy. San Isidro, General Santos City. In Sarangani, the fam tour participants had their time of experiencing the 1.8 km River Tubing Adventure and the Pawikan Nesting Center in Maitum and the Lemlunay Dive Resort in the town of Maasim. Aside from generating awareness, the familiarization tour also encouraged participants to help promote the 12th Paradise that is Region 12.